How to teach to have a level swing? David asked: My son is starting to develop an uppercut motion in his swing. He's dropping his whole back shoulder and coming up under the ball. What drills can be used to have his swing be more level? From your description, it sounds like your son had a level swing at one point, only recently developing these new tendencies. The problem you describe is quite common, the reasons for each player vary. Some possible reasons are a wish to create more power, just wanting to or feeling the need to hit home runs, loss of focus in the batter's box, not seeing the ball early out of the pitcher's hand, not getting his front foot down early enough, thus feeling he is late so he over swings, or getting his foot down early enough; but loading a second time which will make him late, so that he feels he needs to compensate by swinging harder. All, or combinations of the above are possibilities. It will help you to know what has happened to start him dropping his shoulder, as a starting point for making adjustments. If he has had a good level swing in the past, start back with his base and work from the ground up. Balanced stance, see the ball early out of the pitcher's hand, early and slow load/stride, knob of the bat to the ball, head down, swing through the ball, not to the ball. A few hitting drills that can provide repetitions. These are all on my site, as well as some additional hitting and hitting mechanics information in the hitting section. The object here is to drive the ball off the hitter's tee, hitting a tee set 10-12 feet out in front of his tee. To accomplish this, he will need to have good mechanics, keep his hands inside the ball. set a ball on each tee, with the ball in back lower than the front ball. Player sets up, attempts to drive the front ball off the tee, without hitting the ball on the rear tee. To be successful, you can't be pulling your head, which in turn drops the bat barrel, ending in hitting the rear ball, or the tee stem. 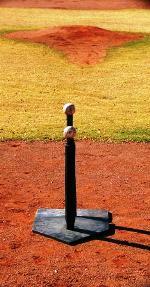 Long looping swings result in swings and misses, pop flies and fly balls, all the easiest outs to record on the field. With this drill you set a ball on the ground, out in front of the tee he is hitting on. You are working on focus. Hitter starts out by looking at the ball out in front, transferring the focus to the ball to be hit, swing. As he gets familiar with that portion, switch to keep his focus on the ball out front, and swing without moving his focus back. This part is hard to do. Hitting fungos, or in this case just throwing balls up and hitting them, whether there is someone fielding them or not. Establishes a rhythum for the hitter, concentration is on hitting ground balls and line drives. If there is a problem in their swing at the plate, it will show up when they hit fungos as well. You can do this drill in a cage, less ball pick up; but you can do it live on the field also. Start by throwing short toss and having the hitter say "ball" when he first sees it. Second step is he says "ball", then says "hit" when he swings. Third step, he says ball, the pitcher says hit. He only hits when the pitcher says hit. Helps with learning to let the ball travel. The entire sequence helps player focus and concentration. First and foremost, see the ball!! Good luck as you go forward. Please let me know how things are going for you both. It all takes time and repetitions. Go slow, have fun. Comments for How to teach to have a level swing? Amen for the comment above. The whole time I'm reading this I'm thinking what in the heck is this guy talking about. The bat oath is no t level. The ball comes on a downward angle not flat. The object is to keep your bat on the path of the ball for as little BG as possible. It's instruction like this that messes kids up. You shouldn't allowed to give hitting tips and drills unless you know what you are talking about.